Marbles were made in many materials other than glass. Minerals, stone, clay, crockery, pottery, china, porcelain, cloisonne, gutta-percha, scrimshaw, wood, metal, and more appear here in over 930 color photos. 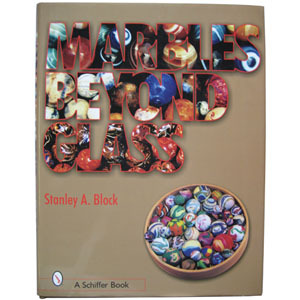 Featured are some of the most highly prized marbles of years-gone-by, including hand cut, milled, and polished banded agates, and handpainted chinas The text also provides valuable information on marble types, clubs, meets, and includes online sites, values tables, an extrensive glossary, bibliography, and appendices. You don't have to be passionate about marbles to enjoy the varieties.